10/11/2016 in Brain Injury Group News, News. After a successful 1st six-months of free, no-obligation advice clinics at the Royal Hospital for Neuro-disability (RHN), Putney, the clinics delivered by members of the Brain Injury Group are set to continue. 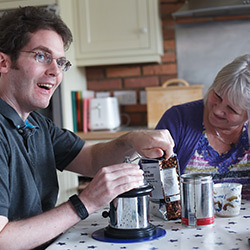 The Legal and Welfare Service (LAWS) aims to give RHN patients, all of whom have suffered a brain injury, their carers and families free, no-obligation advice on the many and varied legal and welfare challenges they face with a view to helping to relieve some of the anxiety and problems they experience. A short workshop, drop-in clinic and private appointments are available on a weekly basis, and arrangements can also be made for advice to be provided at other times as required. LAWS is delivered with the assistance of the Leisure & Family Services team at the RHN which helps to ensure that the service is well advertised, makes the domestic arrangements for each clinic to take place, and administers appointments and ad hoc requests for advice. The advice offered through LAWS at the RHN ranges from guidance on capacity and consent issues that are nearly always present in brain injury cases, to questions about welfare benefits, employment, funding rehabilitation and making personal injury claims. Where appropriate, people may be signposted to other organisations that can provide them with specific support. The Brain Injury Group is looking to extend LAWS at RHN to include specific training for staff and volunteers and the provision of resources including factsheets for all wards. The law firm members delivering LAWS within the RHN are: Penningtons Manches, Moore Blatch, Simpson Millar, Osbornes Solicitors and IBB Solicitors. Advice on welfare benefits and financial matters is provided by specialist independent financial adviser, Nestor. The RHN is a national medical charity, independent from the NHS, which works to improve the lives of adults affected by severe neurological disability through specialist long term care and rehabilitation. Founded 161 years ago, the RHN finds ability in disability and seeks to advance the science of care through its research and education, helping to achieve the best possible quality of life for everyone living with neurological disability.